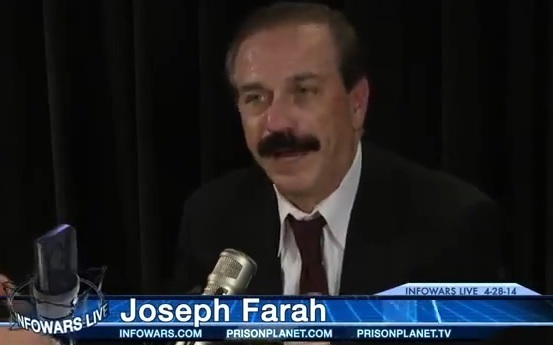 Joseph Francis Farah, a leading ‘birther’ who runs the right-wing, conspiracy website WorldNetDaily, was reportedly caught by TSA agents on Sunday with a loaded .38-caliber revolver in his carry-on bag as he passed through security at Dulles International Airport outside Washington. Farah, who denounced TSA screening practices in a 2010 column, faces a class 1 misdemeanor charge for carrying a gun in an airport terminal, according to a spokesperson for the Metropolitan Washington Airports Authority. He was released pending a summons. The Washington Post first reported the incident yesterday but described the individual in question as Joseph Farah, 49, of Centreville, Va. Hatewatch confirmed with the Metropolitan Washington Airports Authority today that in fact Joseph Francis Farah, who is 59, was cited for the weapon charge. Farah founded WorldNetDaily with his wife in 1997 and serves as publisher and editor-in-chief. The site is a leading platform for far-right, fringe conspiracy theories, particularly about President Obama. Farah and arch-birther Jerome Corsi have used the site to spin wild conspiracies about the president. Corsi not only claims that Obama was born overseas but that he’s gay and Muslim and may have orchestrated the murder of his former gay lovers. I had carefully folded my clothes before placing them in my bag. I had carefully separated the clean clothes from the dirty clothes. But what I found in my bag was that someone had pulled everything out and then stuffed it all back in with little regard for my future cleaning and laundering bills. Farah apparently takes packing very seriously and has thought a great deal about TSA’s screening practices. One wonders then what he was doing with a loaded revolver in his carry-on luggage. Regardless, he just illustrated why we have TSA screenings in the first place.